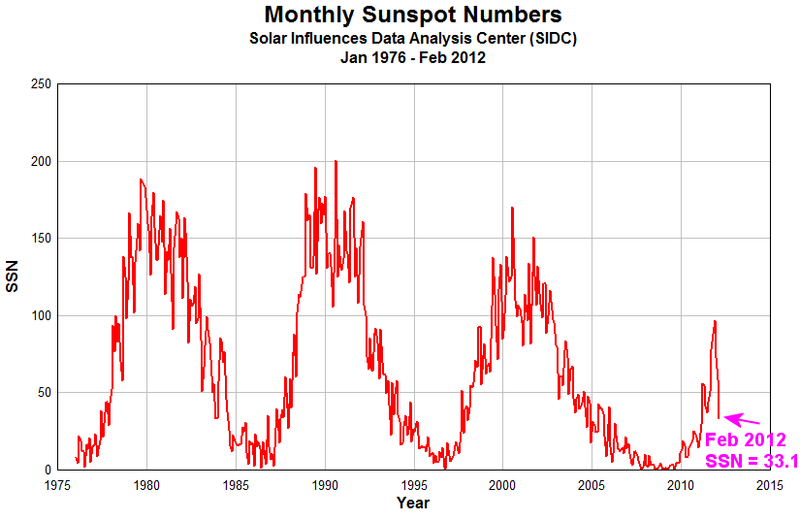 The sun is still in a funk: sunspot numbers are dropping when they should be rising | Watts Up With That? So far, cycle 24 is significantly lower in SSN number that the last three cycles, in addition to having a delayed start. While the delta of the drop in Feb 2012 is not unusual by itself, it is the lowest observed value of the last three cycles this far into a new cycle. 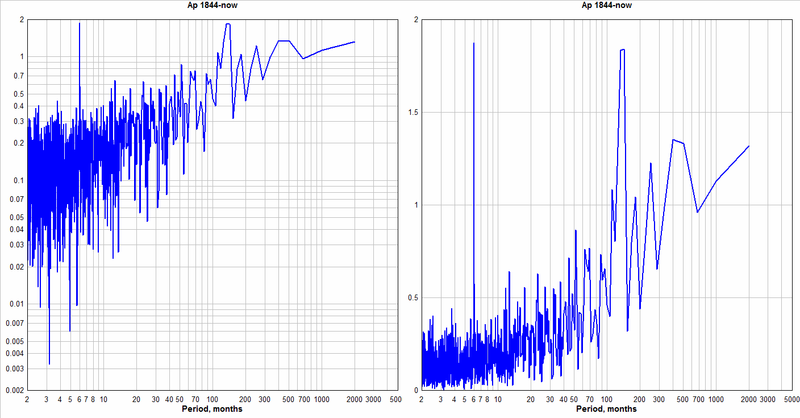 …it shows cycle 24 so far to be on par with cycle 12 and cycle 6 in amplitude. While this drop in SSN number might appear to some as a signal for a possible peaking of cycle 24, there is other evidence that suggests otherwise. For example the Solar Polar Field Strength. Usually the polarity of the North and South solar hemispheres flips at solar max. As you can see in the graph we are close but not quite there yet. And, it has flattened out compared with previous recent transitions. Leif has previously suggested that he thinks for solar polar field will see the flip later 2012 or early 2013. We don’t have long to wait. The Ap Geomagnetic field index, just like the SSN, is down again, suggesting the sun’s magnetic dynamo is not winding up like it did near the peak of cycle 23 and previous cycles. ← Nigel Calder reports on "Yet another trick of cosmic rays"
Dr. Hathaway had already cut back his February ‘prediction’, but now has removed last 6 months from the record and NASA web site is back to September, I hope we’ll see his March estimate soon. This graph says it all. SC24 tracking lower than SC5. It is not possible to compare the old cycles to SC24 using SIDC values. The Waldmeier factor and other discrepancies need to be taken into consideration. And spaceweather.com are quoting a SSN of 24 as I write, lower again. Radio propagation is patchy, too. Interesting times indeed. 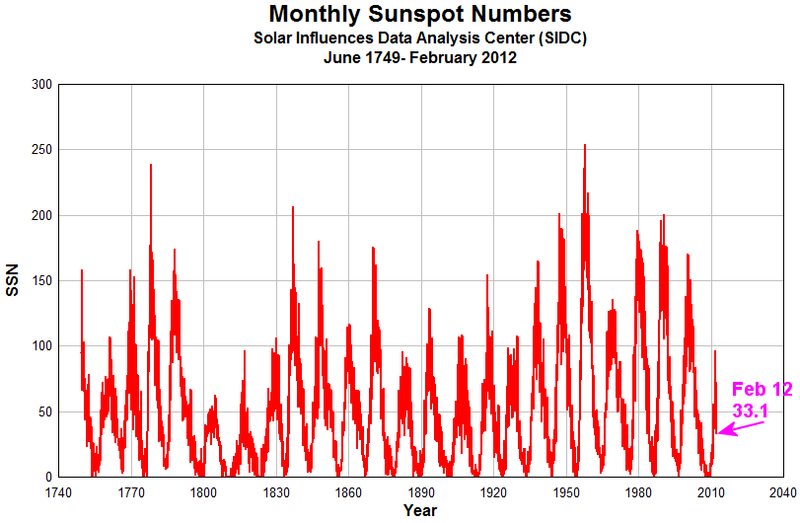 Sunspot numbers shouldn’t be rising at the short timescales (monthly), only the smoothed numbers should. However, the SC24 smoothed sunspot numbers will probably not go higher than ~75 (SIDC) and the maximum will likely look like a double peak or a long plateau, “centered” in ~2014/15. It’s a very weak and long cycle. Cooling will be sudden and dramatic, starting the latest after the maximum. Vuk, it’s not a wrong direction, the smoothed value is in the right direction. It’s hesitating a bit and that’s exactly what makes it a long cycle. Your formula is not right – the SC24 is long. Your formula puts the reversal in 2012 and it will likely be in 2014/15. I took into account the discontinuities according to Svalgaard and made this diagram for comparing the solar cylces 1…24 with the “accumulated monthly sunspotanomaly” since the beginning of each cycle: http://www.dh7fb.de/ssnano/image003.gif . We find, that the negative anomaly is almost as great as in the cycles 5,6,7 untill the 38th month of cycle. Love the WSO Polar Field graph. Betcha the lines cross over on 21 Dec 2012. But don’t anyone tell Bill McGuire at the Guardian or we’ll get more we’re-all-going-to-drown-in-lava pieces from him. Doesn’t anyone know a neat trick for hiding the decline? What scares me most, is that mankind can deal with a little bit of global warming (mostly beneficial, increased rainfall and new crop growing areas), but it will be very difficult to deal with some global cooling (mostly harmful, reduced rainfall and reduced crop growing areas). Behavior of SC24 never ceases to vary far from it’s base course: It hesitates and fades. This is what it has done since it started. Lief, Re WSO polar fields. I presume that this is related to the slowing of the circulation velocities? Does a field reversal have a precedent in documented science? Is is speculated that one or more of the minimums may have yielded a field flip, with the funk? The earth too is undergoing a field change. Is the sun inducing any magnetic response by the earth? Evidently, the terrestrial field flip, though long overdue, will not pose any catastrophic effects to life. What then of the sun? I am buying insulation while my neighbors are planting orange trees. In 1990, James Hansen wrote that “comparisons of available data show that solar variability will not counteract greenhouse warming.” Conversely, in 2009, he wrote, “it is likely that the sun is an important factor in climate variability.” As Hansen moved toward this shift in perspective, a Russian space program scientist had come out swinging, boldly predicting that Hansen’s forecasted warming during the next half-century would simply not come to pass. As an aside Bastardi and that other guy Corbyn who rely on Solar for forecasts have been probably nearly 90 accurate in longer term weather/climatic predictions (ie months), pretty amazing actually. Cycle 24 (as Leif has pointed out frequently) looks a lot like Cycle 14, which was also very ‘spiky’, each spike or surge having a rather long period on the order of 6-2 months or so. So we’re in the second large surge of Cycle 24 (the first started in Feb 2011). It’s starting to bottom out and then begin a third surge, which will peak later this year. I think we can expect this 3rd surge to be as large or larger than the second one, which peaked in December. Luckily, not quite true. The IPCC has painted itself into a corner. If it agrees that something other than CO2 is driving climate, then the certainly that it wrote about in the TAR and AR4, is shown to be just plain wrong. If the sun is having a huge effect, then it cannot be “very likely” that CO2 caused the changes observed at the end of the 20th century. > … order of 6-2 months or so. Today we have a plethora of solar monitoring instruments and so know a bit more about this our nearest star. It would seem that the sun has decided to have a bit of a rest probably as an answer to alarmist claims that the sun has little to do with climate. Interesting post with more to follow I am sure. We’ve already had the notion that temperatures may fluctuate down (El Nino) but when the warming comes back; unless we buy(!) into the AGW, it’s going to be even warmer!!! If at the end of the day, it turns out that climate change is driven primarily by natural variations and that CO2 has little if any driving force, I do not see that scientists will be able to hide behind the sun, and claim that it was not foreseeable that the sun could have any significant input in driving climate variations. A claim of how were they to know, to the layman does not sound compelling. The reason why at the end game, there will be a blame game is due to the stance that politicians took to address the cAGW threat. When the end game pans out, citizens in the West are going to wake up in a very different world. The price paid will be stark to the citizens of the West and regrettably it will be a price that will be paid for decades to come. It is already too late to roll back the clock and unpick the damage done. The politicians will have left the West significantly de-industrialised and with high energy costs pushing millions to the brink of fuel poverty. The high energy costs will leave whatever small amount of industry that is left in the West at a significant competitive disadvantage. This will result in long term unemployment issues. Politically, the balance of power which was anyway shifting from the West to China has been greatly hastened and widened. There will be the USA and the BRICS. The UK and Europe will be demoted to sweeping the crumbs dropped from the high table and the USA will find itself marginalised since initially the BRICS collectively but then later China alone will run the show. Given this backdrop, the citizens of the West will demand answers. It will not be a pretty sight, since the political response was so obviously devoid of merit (it should have been limited adaption only as and when absolutely necessary with no wasteful attempts at mitigation) and the science, when viewed with the benefit of hindsight as will inevitably be the case when judging past events, will appear so flakey and devoid of rigorous scrutiny that severe damage will have been done to science generally and the reputation of scientists. The media because of its own complicity in this affair will attempt to keep a lid on matters but given the diminishing importance of MSM, that will ultimately prove unsuccessful. What does it matter? As per Dr. Leif Svalgaard’s previous posts, how much does the Sun affect the Earth’s Climate, “not much”, says Dr. Svalgaard. It appears the only reason to “look” at the Sun is for coronal mass ejections. These may affect satellites. Therefore, “looking” at the Sun is just about scientific curiosity. One downblip doesn’t necessarily mean it’s going to end up with a lower max; previous cycles have similar downstrokes at similar phases. What’s definitely clear from the graph is that cycle 24 is slower and later than previous cycles. They are there already. “there will be a flattening or slight fall in global temps over the next few years before global warming restarts afresh and more vigorously”. I think that was Mann and Hansen who said it, although I’m not certain. think I will be hunting out short cool season seeds for the coming planting. There are several other cycles that had huge up and down swings like this. This is not that abnormal. Has anyone noticed that the Solar Flux has dropped to below 100? Could SC24 be waning? No, weak cycles have shown erratic behaviour during their maximum years, e.g. The Solar Flux seems a more stable metric than sun spots. It looks like a DC offset, like the top of a pyramid that’s half buried. When what little SC24 has to show, is it possible the Solar Wind could just stop? SC24 has peaked. You heard it here first. I noticed on the Solar Page that Total Solar Irradiance (TSI) -F10.7-MF-SSN-Solar Activity Plot seems to show a peak then a plummet. Oh where oh where have the sunspots gone? I just got an email with pics of Russia in winter… Would those north of the Mason-Dixon line look like that? Where are all the Canadians going to live? Northern Europeans? Avoid the rush! I’m moving south now! If total energy is the sum of sunspots plus some factor times squared mag field, the sun ihas been in a real slump for the past decade! What are the conditions like? I have been off air for so long (travel too much) I have no recent reference. So, the alarmists were right, after all … in the 70’s, when they were calling for the next ice age. They should have stuck with their original story. A lesson all crooks and grifters eventually learn the hard way. Surely, all that lovely CO2 will prevent any discomfort from a solar minimum? After all, it’s the CO2 responsible for ALL warming, isn’t it? The solar polar fields reverse in every solar cycle, usually near maximum. Being in Northern Vermont, I was cheering on the gradual warming of our hemisphere, but I’ll adapt to whatever comes along. Dr. Jerry Pournelle has been a rational and reasoned skeptic for many years and has recently taken up the topic again with his readers. His questions and assertions are worth reading at Chaos Manor. Has anyone looked at monthly Sun Spot Numbers for November and December and compared them with minimum temperatures for the following months January and February? There is a good match between minimum Sun Spot Numbers and minimum NH temperatures going right back through the data records. Sun spot numbers are matching individual temperature records from the northern hemisphere during winters, I would guess that the input from the sun was driving temperatures. Did someone really say that the Sun has no effect on the Earth? it sounds to me like they may have been took out of context, because I don’t believe someone could make such an idiotic comment and actually mean what it infers. From watching Anthony’s solar reference page, it seems to me that the end of the month was quieter than the beginning. Don’t know if that means anything. When I see the low SSN during the 1800-1820 period and the low SSN before 1890, what jumped out at me are September 1815 and August 1883. It caught my eye as soon as I saw the graph. Coincidence? If there is a major volcanic eruption during this lower than normal Sun activity, I’ll laugh my buttocks off. Just saying!?! It is too early to make a huge splash about this drop in solar activity. Give it a year or so to see if we get another pulse up in activity. I am guessing that the odds are at least 2:1 that we’ll see the current high numbers for SC24 exceeded easily by then. This is totally Bush’s fault. Leif stated a few years ago, that it takes 6 months for changes in the sun’s magnetic field to propagate all the way out to the heliopause. Something to do with interactions with plasma. Because of this, any changes in GCR that are caused by changes in the sun’s magnetic field, will take 6 months to phase in completely. All this illustrates is how ignorant we really are. We would all be better off if everyone admitted to their common ignorance and got on with correcting that situation. This all harkens back to Plato’s dialogue Theætetus. All this illustrates is how ignorant we really are. I too believe we are ignorant of the Sun. My “DC offset” theory simply goes back something Anthony talked about on the Ides of March in 2008 as a “step function (or discontinuity) in 2005”. There’s no way the CAGW crowd can use this as a cop-out. In doing so not only would they concede that the sun is a primary driver, they would put themselves in a position contending that it is an even stronger driver than skeptics purport, because it has to override CO2. In which case, we should immediately disband everything “green” in favor of a huge ramp-up of fossil fuel usage to maintain global temperatures, fighting the sun’s influence toward a mini ice age. So, yeah…. I’m sure they’re cooking up something, but don’t expect an easy out. It’s just not their style – they’d rather twist it somehow to further their cause. When someone is honestly 55% right that is very good and there is no wrangling. And if someone is 60% right, it is wonderful, it is great luck and let him thank God. But what’s to be said about 75% right? Wise people say this is suspicious. Well, and what about 100% right? Whoever says he’s 100% right is a fanatic, a thug, and the worst kind of rascal. Ask climate scientists, it’s in their Nature. This event coincided with a perihelion of Jupiter. The link to Oulu I posted above doesnt work too well . Even uber-warmist Germany is starting to see the light. The new book Die kalte Sonne (The Cold Sun) is creating a stir. Sorry, maybe [someone] has asked this before, but why-oh-why in the 21st century do you use “decimal years” on the x-axis? Converting to dates is easy. No matter what system you use, there are a plethora of scripts/methods/macros to calculate the date. If this is a motion, I’ll second it. with March ‘prediction’ for SC24 max severely trimmed back (just below 60) from his previous estimates. Can I assume that Dr. S. still holding firm? Mine is an extrapolation now 9 years old, no change is allowed. 1) the earth will cool due to low solar activity. they will find a way to selectively rationalize anything. After all, the minimum a rational person can use for “climate” must be a full PDO, but the scammers try to use a 1/2 PDO since it supports their rice bowl, so why would we expect them to “dumb up” and not try to have some clever rationalization? During the big freeze last year here in Ireland,a professor of geography was interviewed on national radio and asked about possible links between sunspots and earth’s climate. His unchallenged response went something like this, ‘we think about 20% of the current climate change is due to low solar output ( his words) but anthropogenic global warming is still happening in the background’.His 20% is interesting (wherever he got it), as it could be the beginning of a slippery slope for the warmists. That may have been the cause in May of 1999. We only really know that the loss of the Solar Wind for a few days is possible. If the decline of solar activity to a threshold point could cause such an event, the duration might be until the Sun ramped back up to that threshold point. As a family man, I really do not like being a forecaster of doom. I will try to shut up about it now. My hat is off to Leif and The Solar Cycle 24 Prediction Panel which reached a consensus decision on the prediction that is proving to be true. The recent drop is meaningless until we hit the projected top and start to turn down. They don’t adjust their projection like the other agencies who predict. Time will tell but so far an amazing prediction. There may be a double peak, with the first peak being the highest then the second a bit lower. Probably some sort of harmonic behavior, where the low frequency content is more energetic near the peak, and, the higher frequency content dominating in the trough regions. If so, then we may have already passed the initial higher peak, which would be bad, bad news. The worst ever. And to boot, the war will exacerbate the cooling! What if we don’t get a field reversal ? Is such an event possible ? Could that lead to a geomagnetic excursion here ? Solstice and Eqinox are not. Data should be recorded in an umabigous way. Also today is the 13th of Esfand 1390 (the 14th century) in the Persian world. Depending how far into the future you’re focused, you may be overlooking the split demographics of the west. Especially if mortality increases with the gradual onset of a grand minimum. Nothing like feet held to the fire to ramp up a practical response. There won’t be time to dwell on mistakes of the past, at least in Europe anyway. The May 24, 2007 List shows the predictions considered. Very interesting but my point was that they don’t change their projections like some do routinely at NASA. They, as a body, stand by their science and predictions and thus far are absolutely amazing!!! the sand and buy charcoal for X-mas…. Probably worth pointing out, the “Solar Cycle 24 Prediction Panel is organized and chaired by NOAA and funded by NASA” so no dis to NASA intended. I would suggest it’s the solarphiles who’ve painted themselves into a corner. We’ve had several years of low (relative to recent decades) solar activity and there has been no significant drop in UAH global temperatures. In 2006 David Archibald wrote that we would be seeing the effects in a “few short years”. According to the CET record, the temperature decline supposedly associated with SC5 had already occurred long before the SC5 peak. In fact much of the decline happened even before SC5 got under way – but we’ll gloss over that. The IPCC (of which I am not a supporter) have always maintained that solar activity was a significant driver of climate change in the early part of the 20th century and before that so they do have a bit of wriggle room in the event of a lack of warming. 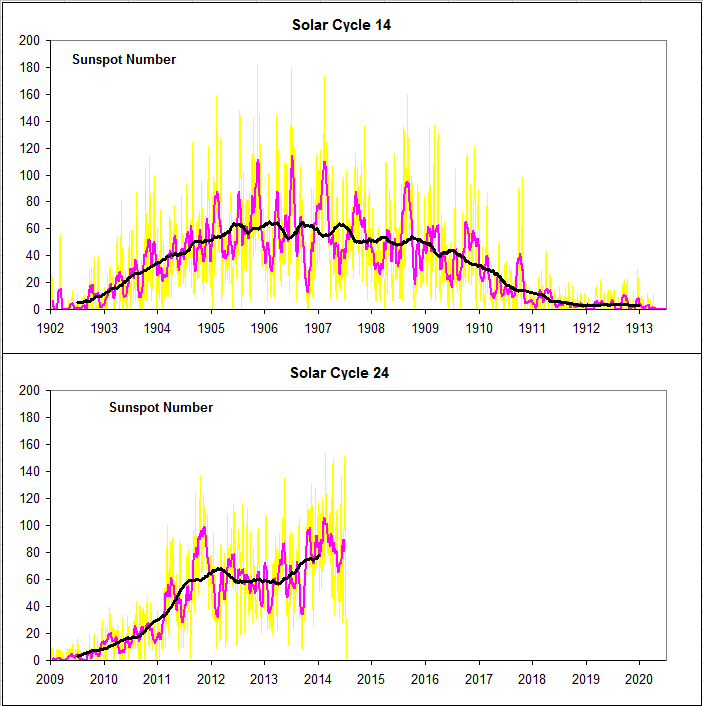 They have also stated, with some justification, that as there was very little trend in solar activity between the late 1950s and the end of the 20th century, solar activity cannot have been responsible for the pronounced warming since the mid-1970s. You cannot fault their logic on this. Since the Chicxulub impact c. 65-million YBP, six succeeding geological eras have averaged about 12 – 16 million years apiece. Given the current Pleistocene’s mere 2.6-million year duration thus far, we expect a minimum 10-million more years of well-defined cyclical ice ages averaging 102,000 years, interspersed with interglacial epochs of median 12,250 years. Absent a 1,500-year impact-induced “cold shock” called the Younger Dryas, which ended some 9,500 YBP, our current Holocene Interglacial Epoch would likely have ended c. AD 450, coincident with fading of the so-called Roman Warm which led to a 500-year Dark Age previous to a Medieval Warm through c. AD 1325 followed by the 500-year Little Ice Age (LIA) which peaked c. 1715 and ended only c. 1885. Now as Sol enters a cyclical down-phase similar to her Maunder Minimum of 1645 – 1715, it behooves researchers to put current circumstances in long-term context and perspective. Quite likely, Pleistocene ice ages are driven more by geophysical/plate-tectonic factors than any relatively superficial surface phenomena– that is, since North and South American continents wall off Earth’s eastern from western hemispheres, atmospheric/oceanic circulation pattens will remain blocked until these continental landmasses once more drift apart. In 1961, Edward Lorenz founded Chaos Theory on a climatological basis, asking “Does Earth have a climate? The answer, at first glance obvious, improves on acquaintance.” Just so, billion-year Pre-Cambrian ice ages persisted while all Earth’s landmasses compressed together in South Polar regions; only in the last 550-million years, about one-ninth Earth’s history, have major plates distributed themselves more equably. For all their detailed expertise, researchers ignoring Earth’s meta-historical development remain blind to critical long-duration processes. The data from the Maunder Minimum start says we are not guaranteed a second, or even multiple peaks. To date, only 1 is in the bank. Huh. “Welcome to solar max…?” Shouldn’t the predicted values curve be adjusted down? It looks like an over-estimate now. Within a few years, there are going to be a lot of angry voters out there in ex-CAGW countries blaming ex-politicians for fraud and mis-representation. The real price however will be paid by the citizens of these same CAGW countries in the West. As usual the innocents will suffer. CAGW will have made the West significantly de-industrialised, with high energy costs and millions will be pushed to the brink of poverty. The landscape will be littered with rusting turbine relics. China will be triumphant as it was many hundreds of years ago. CAGW countries will pick the crumbs from the floor. Viewed in hindsight, no one will believe the long period of insane stupidity. No one will have remembered Stalin and Hitler but the Chinese will have forgotten Mao Tse Tung also. Keep in mind that a lot of smoothing is going on…..First the mean is taken monthly, then the Means are smoothed by taking 12 month running average. It takes about 6 months for a change to show up. This dip we are seeing in the monthly means has been going on for about 3 months . If it keeps going down and staying down for another 3 months, then its time to worry. Lucky you that you were not born then. Could you imagine WHO would have been your Inquisition judge? LOL! Within a few years ……it will be too late. Big Brother will tell you what to believe. You know HE speaks “EX-CATHEDRA”, no doubts will be possible then. SOLAR FLARE ALERT: A moderate solar flare reaching M3.3 took place at 17:46 UTC Friday afternoon. The flare was centered around a new active region on the Eastern Limb. Stay Tuned to SolarHam.com for the latest information. Usually the polarity of the North and South solar hemispheres flips at solar max. As you can see in the graph we are close but not quite there yet. And, it has flattened out compared with previous recent transitions. Has there been a solar maximum were the polarity DIDN’T flip? It would seem that the time is ripe for those that can to invest in coal,gas and oil futures and sit tight. The CAGW thing does not seem to have long to live, the plebs are awakening faster than the sun is declining and the coming years will see a paradigm shift in public and political sentiment. Real facts and truth have always come to the surface, eventually in all facits of life. That we are heading into a cooling cycle regardless of CO2, will eventually dawn on all the pundits. That the sun was due for a holiday was pointed out by some clever people that actually do science, they were pooh poohed by the consensus as the sun apparently has nothing to do with our climate. I have just spent an idyllic two weeks flying around the tropic zones watching Willis’s cooling towers in action, hard to put a number on the quantity of them but myriad would be close. We are but fleas on this planet, an annoyance but no way are we killing the planet, fly over Asia a densely populated area, and what do you see, forests and farm land, green green green. It is time I feel that all people belittled and defamed by the consensus mob stood up to be counted and openly decried the infamy that is CAGW. The story goes that that when Napoleon went to war with Russia, it got so cold, that during travelling, the horse’s backsides and tails froze up. Because of hunger some would cut from the horse and eat it. I am sure the alarmists CAGW will find some reason to blame the coming colder years on our carbon footprint, and perhaps they might not be completely wrong about that either. More CO2 is definitely not going to make it warmer. TYPO: “that” should be “than”? The solar polarity has a signature in geomagnetic activity. We have good data back to the 1840s showing polar reversals at every maximum back to then. Before that, we don’t know for sure. Theoretically, we expect a flip every time. Exactly. There are more active regions now. The collective wise-crackers posting here seem to get in a lather whenever there is a peak or a trough of solar activity. Good grief. Look at the past cycles. The 30 day averages are not the same as the 13 month averages. I have been following this topic at this website for years now and realize there is so much about this that I don’t understand. Can anyone Please recommend a good book to read that a layman can understand. Atmospheric temperatures are experiencing step changes after significant La Niña / El Niño events. These events are discharges of stored energy imbalances; the imbalances accumulate over a decade – over the solar cycle before the event. We see now the unwinding of the step change induced by the 1998 El Niño, being in a quasi-permanent La Niña. The last solar cycle was already weak, this lead to the current La Niña’s. But the current, even weaker cycle will lead to monster La Niña conditions 10 years from now. If you think you’ve seen cooling – you ain’t seen nothing yet. Those alarmists were the same people who later became Global Warming alarmists; Schneider and Hansen among them.Their defining characteristic is that they use EVERY possible scare to run the same kind of racket. The crooks and grifters, including the MSM, will switch effortlessly. Der Spiegel for instance, always on the forefront of CAGW and sustainability and everything green, now decries the de-industrialization caused by extremely expensive and unreliable electricity. They operate without memory – they just produce a new narrative when the time is ripe. They do coordinate behind the scenes; google Journolist for an example, a now-defunct insider mailing list where leftist US journalists coordinated their narratives. I have no idea what any of this means, but It is among the most interesting of recent scientific observations. It gives one cause to get out of bed in the mornings; just to see where it is all leading. And hopefully Dr Svalgaard will from time to time enlighten us on what it is all about (or appears to be). It appears from some of my results that (the time of ) lower sunspot numbers coincides with the lowest temperatures in winter in the SH. 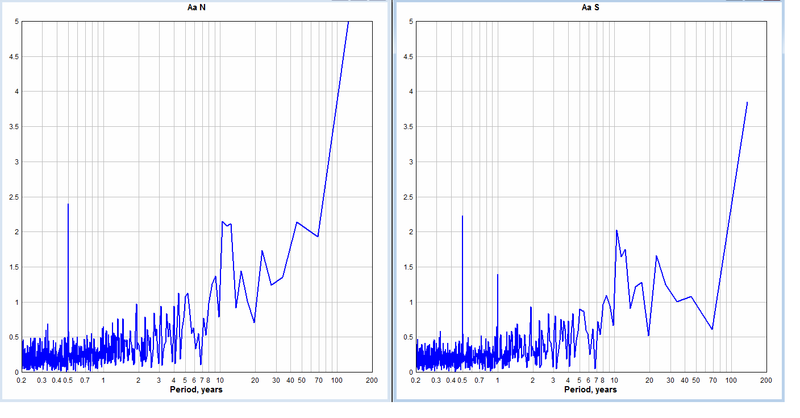 might you perhaps have any idea as to why they could be a correlated? David Archilbald predicted right here 3 or 4 years ago that SC24 would have a max SSN of 40 (Mean) he is so far spot on and everybody else has been way way off including Hathaway (150, originally), Svalgaard etc. Would this indicate that 22 yr input is not from TSI but from solar wind as a vector? See the above link for the relevant graphs. except that SC24 max is at least 1-2 years away, unless you know otherwise. The solar wind had no influence on the climate, and in particular not its vector properties [sign of magnetic field]. No ideas needed. There is a weak 22-yr cycle in Ap, but it does not rise above the background noise using the [admittedly] poor FFT. If it had a climate influence it should, one would surmise. it is too much for a coincidence. Is it not so that during low SSN there is more UV coming from the sun? No. it is too much for a coincidence. The correlation of Low Sunspot Activity (and low solar activity) to colder climate does not necessarily mean that the Sun is the prime or lone source of causation. After all, at the Galactic level, it is not yet known for certain why this Spiral Galaxy we call home is still in one piece. And that holds true for all the Spirals we have rotational gradient data for. In both cases, we only know that it is so. This proposed Dark Matter, and it’s counterpart Dark Energy, if that’s what it is that holds the Spirals together, might just be of a nature that it affects stellar activity as well. As in waves. We cannot see or measure what holds the Milky Way together. Why should we presume to be able to see that which is affecting the Sun? (it appears that my ISP is doing some maintenance, so access is slow and intermittent at the moment). As I said, there is a weak 22-yr cycle, but it does not rise significantly above the background noise [there are lots of other peaks]. 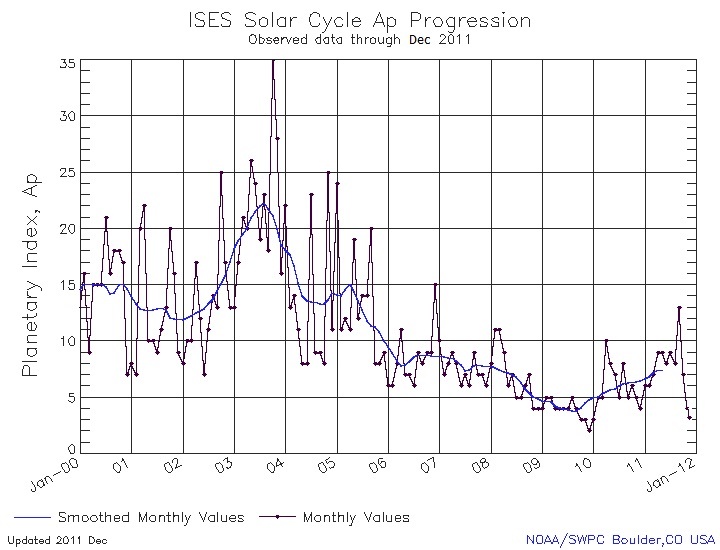 The dominant peak [which is significant is the normal solar cycle peak near 11 yr. If the solar wind is a driver, the 11-yr peak should be in the climate too. It is also not correct to call the 22-yr cycle in aa as a ‘Hale cycle’, as it has nothing to do with the Sun, but rather with the orientation of the Earth with respect to the Sun. If the Earth were in the equatorial plane of the Sun, there would be no 22-yr cycle in Aa. By the way, you I believe that you have been far too kind to Hathaway and NASA about their horrid SunSpot Number Predictions … If it had not been for you and a precious few others sitting on the panel there, their predictions may have been over 200 due to their total misreading http://www.physorg.com/news86010302.html and they would likely have maintained that prediction for much longer than they did : In Nov 2008, Hathaway et al changed their scaling http://wattsupwiththat.com/2009/03/08/more-revisions-to-the-nasa-solar-cycle-prediction/ in an attempt to obfuscate the sudden revision from a 150 max to more like 100, and they have continually revised their prediction down since then. Also, you have been too modest, I believe you made separate predictions. I don’t recall exactly what your 2007 or so prediction was for this cycle, but I probably have it somewhere… possibly in the 90 area. I know the ~2007 predictions had bimodal distribution – some in the 150+, and other hump in the 80 range – using different prediction methods – I have a table of those saved somewhere but won’t look for it now. .The NASA group was absolutely wrong, and honestly, all their analysis now is not very convincing as a result. The prediction based on the planetary cycles is intriguingly good. Of course – this whole post is based on a yet to be proven future – and that the maximum proves to be below 100 for Cycle24 – we’ll see. @Andrew30 — this post may interest you both. Leif – addendum to above note – if you can find it quickly, if there is a monthly average of AA data available, would you please link it? Also – I wish I could edit my 10:00AM post to include that the planetary influence sunspot predictions for SC24 were made about 2004, which adds to the impressiveness of that feat. But that implies less UV during low SSN? Can’t win them all; still link for Aa North would be appreciated (thanks in advance). It peaks around 60 years, so it should cheer up the 60yr-philes. Ahh- Just found paper- Lief, Cliver and Kamide (2004) predicted SC24 to be max SSN of 75 +/- 8 in 2011. Significant miss (probably) in year due to the unexpectedly long SC23. What if there were a higher realm of power in the universe that made our Sun go quiet for a time to teach the pesky humans a lesson? It may not be coincidental that I’ve been thanking God for the extended solar minimum since the House passed the cap-n-trade bill back in 2009. I’m glad the bill didn’t pass the Senate due to the cooling planet since then. It’s the Sun stupid. Either way we win. is that more UV from the sun may in fact lead to less UV reaching the bottom of the atmosphere. or are they at sea level, on a cloudless day? The heliosphere is being compressed. An energized Fluff is reducing the area of the heliosphere and this makes the scarce gases more abundant. This is the key to researchers on E finding answers to long sought missing parts of solutions. The problem is that there is only 10 months left to discover all the answers. And of course, when the MW capacitor overloads and discharges, the heliosphere goes back to ‘normal’ and nothing of the solutions will work. One assumes that the hope is that some form of energy will be found that will allow this massive compression that revealed our secrets to be maintained. Probably not. And once the return to normal, the hotter than Hell gas giants will be presenting an entirely new condition to Sol which is why NASA says much weather disturbance ahead. 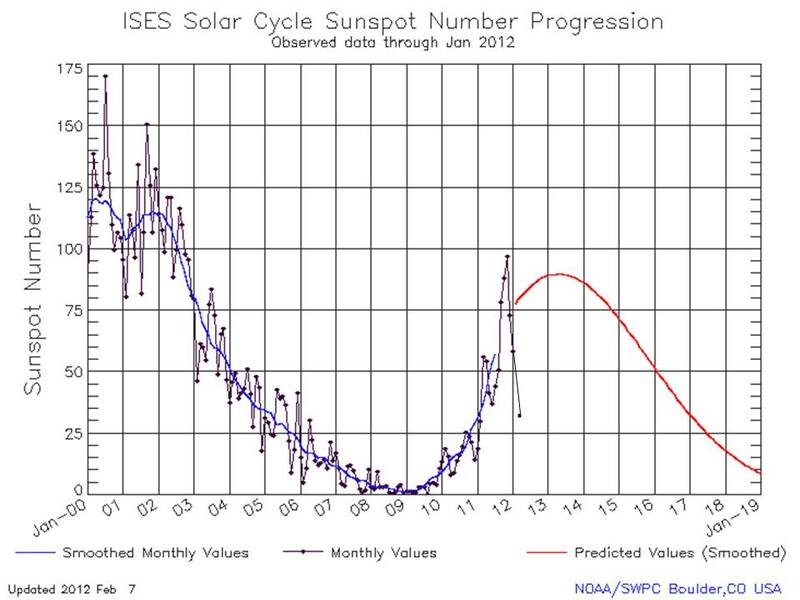 It would appear that the ISES Solar Cycle Sunspot Number Progression updated today is slightly different from what was posted here. It looks like December was replaced with February. Of course I have been wrong before. Ah, it was referenced, I thought it hadn’t. Very good!